The Honor View 20 smartphone was launched in the Indian Market and available on Amazon.in website. The Honor View 20 premium smartphone starting price is Rs. 37,999 in Indian Market. This premium smartphone comes with 48-megapixel camera accompanied by an advanced TOF 3D camera, in-screen AI camera design, powered by 7nm Kirin 980 chipset with dual NPU. This smartphone comes with a 6.40-inch touchscreen display with a resolution of 1080 pixels by 2310 pixels. This smartphone is powered by octa-core processor and it comes with 6GB RAM and 128GB internal storage capacity. The handset is comfortable to hold and there is no notch at this smartphone. The Honor View 20 smartphone comes with triple Wi-Fi Antennas and really helpful when playing games like PUBG. The Honor View 20 smartphone runs on the Magic UI, which is based on Android 9 Pie. This smartphone comes with 4000mAh battery with super charging facility. If we talk about the camera concern, the Honor View 20 smartphone comes with 48-megapixel (f/1.8) primary camera on the rear and a 25-megapixel front shooter for taking selfies. 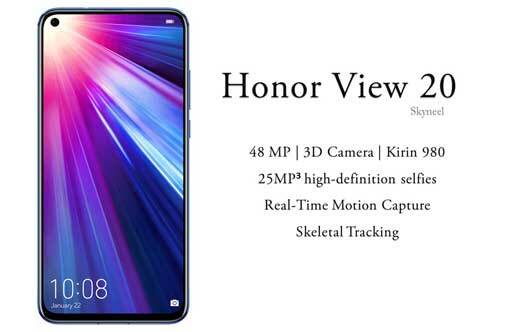 Honor View20 smartphone comes with Hole Punch display design, with 48 megapixel rear camera with Sony IMX 586 sensor. This smartphone replaces the notch with a punch hole. Honor View20 has been introduced in Europe in two storage variants with three color options. The first variant comes with 6GB RAM and 128GB storage capacity, priced at Rs. 37,999. The second variant comes with 8GB RAM and 256GB storage capacity, priced at Rs. 45,999. The smartphone comes with 2310 x 1080 pixels resolution with a 6.4-inch Full HD + LCD display with 19.25:9 aspect ratio. If we talk about the connectivity feature this smartphone comes with Wi-Fi 802.11 a/b/g/n/ac, dual-band, WiFi Direct, hotspot, Bluetooth v5.0, GPS, NFC, Infrared port, USB 3.1, Type-C 1.0. Must Read: Realme U1 Vs Huawei Honor 10 Lite – Which is the better Smartphone? Memory Available in – 6GB+128GB /8GB+256GB Storage capacity. Display 6.4-inch Full HD + LCD display, 1080 x 2310 pixels resolution with Mali-G76 MP10 GPU and 19.25:9 aspect ratio. Camera 48-megapixel Primary with (f/1.8) with LED Flash, Panorama, HDR and 25-megapixel (f/2.0) front camera for taking selfies. Battery 4000mAh with fast charging support. Connectivity Dual Nano SIM. Supports 3G, 4G, Wi-Fi, Bluetooth 5.0, GPS. Price & Color Priced: 6GB+128GB available at Rs. 35,999 and 8GB+256GB available at Rs. 45,999. Color: Saphire Blue, Phantom Blue, Phantom Red, Midnight Black. This is a premium budget nice smartphone for all those users who don’t want to get more in his smartphone.